On 23rd December, 1950, Lodge Dolphin No. 911, celebrated its 50th Anniversary with a Jubilee Dinner. Among those attending were Brothers the Earl of Eglinton and Winton, Junior Grand Warden, Thomas Pitcairn, Provincial Grand Master, Andrew R. Bain, Immediate Past Provincial Grand Master and Alexander F. Buchan, Grand Secretary. Brother Robert Roy, Master, who later became a Substitute Provincial Grand Master, was in the Chair. Many Brethren from the Province attended the official opening of the Masonic Home, Ault Wharrie, Dunblane, by HRH the Princess Royal, on 27th October, 1951. The Grand Master Mason, Brother Sir Charles Malcolm Barclay-Harvey of Kinord, was in attendance. By 1952, the number of Lodges in the Province exceeded 20 and the appointment of an additional Substitute Provincial Grand Master was available to the Provincial Grand Master. The year 1954 was, for Brother Thomas Pitcairn, a memorable one. Not only was he installed for a second term as Provincial Grand Master at a ceremony carried out by the Grand Master Mason, Brother Lord Macdonald of Sleat, in the Masonic Temple, Lint Riggs, Falkirk, on 20th May, but he was also installed as Substitute Grand Master Mason at the Grand Lodge Installation in November. On 15th November, 1957, the Lodge of Alloa No. 69, held a Dinner as part of the Lodge’s Bi-centenary Celebrations. Grand Lodge was represented on that occasion by Brother the Earl of Elgin and Kincardine, Past Grand Master. The Provincial Grand Master was also in attendance. For some time the Provincial Grand Master had been in ill-health and Brother Pitcairn intimated his resignation on 28th January, 1958. On the same date Brother Lawrence Sangster was recommended as his successor. Brother Sangster was installed by the Grand Master Mason, Brother the Earl of Eglinton and Winton, on 26th June, 1958, within the Masonic Temple, Lint Riggs, Falkirk. In 1959, Lodge Zetland No. 391, Grangemouth, celebrated its Centenary. In the same year Lodge Stirling Royal Arch No. 76, celebrated it Bi-centenary. On both occasions Brother Sangster was accompanied by Deputations from Grand Lodge. On 23rd February, 1960, Brother Major Ronald A. Orr-Ewing presented his personal Scots Guards Sword to Provincial Grand Lodge for use by the Provincial Grand Tyler. Brother Sir Norman A. Orr­-Ewing died in 1960 and Brother Major Sir Ronald A. Orr-Ewing succeeded to the title. 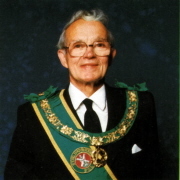 On 29th January, 1963, Brother Sir Ronald A. Orr-Ewing was nominated as Provincial Grand Master and he was installed on 23rd May, 1963, by Brother Lord Bruce, Grand Master Mason, in the Masonic Temple, Lint Riggs, Falkirk. Brother Thomas Melville, who had been Provincial Grand Tyler for 25 years, was presented with a Tyler’s jewel by Brother Lawrence Sangster, Provincial Grand Master, on 30th April, 1963. A suitable presentation was also made to Mrs. Melville. On 20th May, 1964, the year that marked 650th Anniversary of the Battle of Bannockburn, the Grand Master Mason, Brother Lord Bruce, laid the Foundation Stone of the plinth supporting the statue of King Robert the Bruce at Bannockburn. The working tools were on this occasion carried by the members of Lodge St. John No. 16. The Provincial Grand Master consecrated the New Masonic Hall in Kilbagie Street, Kincardine, for Lodge St. John No. 598, Tulliallan, on 29th August, 1964. On 21st August, 1965, the Provincial Grand Master consecrated new Lodge rooms, situated in Bo’ness Road, Grangemouth, for Lodge Zetland No. 391. A very large number of Brethren of the Province attended Grand Lodge on 30th November, 1965, when the Provincial Grand Master, Brother Major Sir Ronald A. Orr-Ewing was installed as Grand Master Mason. Following his installation, he intimated his resignation as Provincial Grand Master. On 4th May 1966, Brother William McKay Glegg, a Past Master of Lodge Carron No. 139, was elected in his stead. 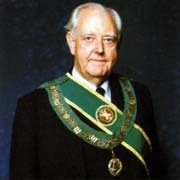 Brother Glegg was installed as Provincial Grand Master on 19th May, 1966, at Lint Riggs, Falkirk, by his predecessor now acting in his capacity as Grand Master Mason. A decision had been taken in Grand Lodge to build a further Masonic Home in the grounds of Ault Wharrie, Dunblane, and Grand Lodge sought the help of the Provinces and Lodges to raise the projected cost of £100,000. Provincial Grand Lodge agreed at the Communication on 31st January, 1967, to contribute £1,000. Lodge St. John No. 484, Slamannan, celebrated its Centenary on 1st August, 1968. A Deputation from Grand Lodge was headed by the Grand Master Mason, Brother Sir Ronald A. Orr-Ewing and, from Provincial Grand Lodge, by the Provincial Grand Master, Brother William McKay Glegg. New Lodge Rooms, for Lodge St. Andrew No. 176, Denny, were consecrated by the Provincial Grand Master on 15th February, 1969. A very large number of Brethren attended at Dunblane on Saturday, 6th September, 1969, when Lady Orr-Ewing opened the new Masonic Home to be known as Ardnablane. It was estimated that the company on that occasion numbered over 400. The Provincial Grand Master performed the consecration of Lodge Camelon No. 1456’s new hall at the Hedges, Camelon, on 19th August, 1972. A Deputation from Grand Lodge, headed by Brother Sir Ronald A. Orr-Ewing, Immediate Past Grand Master Mason, also attended. The Centenary Celebrations of Lodge Abercromby No. 531, were held on 3rd and 4th February, 1973. The rededication ceremony was carried out by the Grand Master Mason. The Provincial Grand Master headed a large deputation from Provincial Grand Lodge. A Centenary Church Service was held in Chalmers Church, Bridge of Allan, on 4th February, the Service being conducted by Brother Rev. 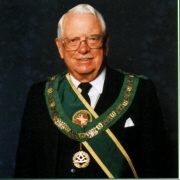 J. Stewart Lochrie, Past Substitute Grand Master Mason. The 50th Anniversary of Lodge Clackmannan No. 1303, was celebrated on 24th February, 1973, when the Provincial Grand Master, Brother Dr. Hector Campbell, carried through the ceremony of rededication. On 1st November, 1974, Lodge Bannockburn Bruce and Thistle, No. 312, held its 150th Anniversary Celebrations in the presence of the Grand Master Mason and the Provincial Grand Master. Brother Angus Campbell, a Past Master of Lodge Craiginnan No. 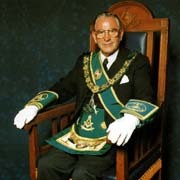 850, was recommended as Provincial Grand Master, at the meeting of Provincial Grand Lodge, held on 28th January, 1975. He was installed by the Grand Master Mason, Brother Captain Robert Wolrige Gordon of Esslemont, at Alva on the 29th August, 1975. A rededication service to commemorate the Centenary of Lodge Callendar No. 588, was held in the Masonic Temple, Lint Riggs, Falkirk, on 6th May, 1976. The ceremony was conducted by the Grand Master Mason, Brother Captain Robert Wolrige Gordon of Esslemont. A large deputation from Provincial Grand Lodge also attended. A Centenary Dinner was held later the same evening in the Falkirk Ice Rink. The Grand Master Mason again visited the Province on 5th February, 1977, when he carried through the rededication ceremony on the occasion of the Centenary of Lodge St. John, Tulliallan No. 598. A deputation from Provincial Grand Lodge, headed by the Provincial Grand Master, Brother Angus R. Campbell, also attended. On 2nd September, 1978, the Provincial Grand Master consecrated new premises in Banchory Place, Tullibody, for Lodge Ladywell, 1474. Almost one year, to the day, later on 1st September, 1979, he consecrated new premises in Grahams Road, Falkirk, for Lodge St. John, No. 16. Brother Alexander Whitehead, Past Master of Lodge Ancient Stirling No. 30, was recommended as Provincial Grand Master on 30th November, 1979 and was installed at Alva by Brother Sir James W. McKay, Grand Master Mason, on 8th May, 1980. The Provincial Grand Lodge held a Charity Dance, on 24th April, 1981, when some £2,000 was raised for local charities. The Provincial Grand Master had the privilege, on the 20th August, 1983, of consecrating the new Lodge premises of his Mother Lodge at Forth Street, Stirling. He was further privileged to have as a member of his deputation, Brother Sir Ronald A. Orr-Ewing, Past Grand Master Mason, who was also visiting his Mother Lodge. Brother Robert Hutchison, a Past Master of Lodge Buchanan No. 1419, was recommended as Provincial Grand Master on 25th October, 1984 and was installed by the Grand Master Mason, Brother J. M. Marcus Humphrey of Dinnet at Alva, on 3rd May, 1985. Early in 1987, Provincial Grand Lodge made a substantial donation to the provision of a mini bus for the Royal Scottish Masonic Home and throughout the next few years the Daughter Lodges joined Provincial Grand Lodge in generously supporting the Grand Master Mason’s appeal for the development of the Scottish Masonic Homes. Brother Cohn T. Wyse, a Past Master of Lodge St. Servanus No. 771, was recommended as Provincial Grand Master on 26th October, 1989. He was installed at Alva by the Grand Master Mason, Brother Sir Gregor MacGregor of MacGregor, on 12th May, 1990. Two weeks later, on 26th May, 1990, Brother Colin T. Wyse returned to his Mother Lodge, St. Servanus No. 771, at the head of a large deputation from the Provincial Grand Lodge of Stirlingshire, to carry out his first official duty as Provincial Grand Master on the occasion of the Lodge’s Centenary Celebrations. The Grand Master Mason carried out the ceremony of rededication. The Bi-centenary Celebrations of Lodge St. Andrew No. 176, Denny, were held on 20th October, 1990, when the ceremony of rededication was carried through by Brother Sir Gregor MacGregor of MacGregor. The Grand Master Mason again visited the Province on 11th May, 1991, and carried out a rededication ceremony for the Centenary of Lodge Strathendrick No. 780. Provincial Grand Lodge deputation was on each occasion headed by the Provincial Grand Master, Brother Colin T. Wyse. Brother Dr. Hector C. Campbell, Past Depute Grand Master Mason, and a deputation from Grand Lodge, visited Lodge Ben Cleuch No. 782, Tillicoultry, on 29th February, 1992, to carry out the ceremony of rededication on the occasion of the Lodge’s Centenary. Brother Colin T. Wyse, Provincial Grand Master, again headed a large deputation from Provincial Grand Lodge for this occasion. The Royal Scottish Masonic Home at Dunblane held an Open Day on Sunday 31st May, 1992. The day had been organised by the various Provincial Grand Lodges in Central Scotland and it was a resounding success. At the Quarterly Communication of Provincial Grand Lodge, which was held on 28th April 1993, the Provincial Grand Master presented a gift of Edinburgh Crystal to Brother Frank R. Imrie, C.A., who had served for 15 years as Auditor to Provincial Grand Lodge. He also presented a Past Provincial Grand Chaplain’s apron and sash to Brother Rev. John Watson on his leaving to take up permanent residence in Cyprus. On Saturday 15th May, 1993, the Centenary Celebrations of Lodge Polmont No. 793, were attended ),y large deputations from the Grand Lodge of Scotland and the Provincial Grand Lodge. The Grand Lodge deputation was headed by Brother the Lord Burton, Depute Grand Master Mason, who carried through the ceremony of rededication. The deputation from Provincial Grand Lodge was led by the Provincial Grand Master. Lodge St. John No. 484, Slamannan, celebrated its 125th Anniversary on 14th August, 1993. The Ceremony of Rededication was carried out by Provincial Grand Master, Brother Cohn T. Wyse, Provincial Grand Chaplain, Brother Rev. George Gillon and Office-bearers of Provincial Grand Lodge. At a Quarterly Communication of Grand Lodge, held on 5th May, 1994, Grand Lodge accepted the recommendation of the Petitions, Complaints and Appeals Committee and of Grand Committee that Lodge Buchlyvie No. 1268 be declared dormant. The qualified members of the Lodge had previously voted overwhelmingly for closure at a special meeting of the Lodge and consequently the relevant information and facts were reported to Grand Lodge for deliberation. The recommendation for dormancy was made to Grand Lodge after due consideration of all the relevant facts submitted by Lodge Buchlyvie and Provincial Grand Lodge - a sad day for the Province. The last official Provincial Grand Lodge meeting prior to the Rededication Ceremony on 4th February, 1995, was a Service of Thanksgiving in Denny Parish Church on Sunday, 29th January, 1995. The Service was conducted by Brother Rev. Richard Smith, B.D., and Provincial Grand Chaplain, Brother Rev. George Gillon, M.A., C.F. The Grand Master Mason, Brother The Right Honourable The Lord Burton, attended Provincial Grand Lodge within the Masonic Hall, Alva, on 4th February, 1995, and carried through the Rededication Ceremony on the occasion of the 250th Anniversary of Provincial Grand Lodge. The Right Worshipful Provincial Grand Master presented a substantial cheque to the Grand Master Mason for Masonic Benevolence purposes. For further details of the 250th Celebrations click the S&C.